DUBAI, UNITED ARAB EMIRATES--(Marketwire - Feb 25, 2013) - With Dubai International Financial Centre increasingly becoming a hub for arts and culture within the UAE and the Middle East, The Ritz-Carlton, Dubai International Financial Centre is benefiting from a growing number of outside catering events in the sought-after Gate Village, as well as an influx of luxury and fashion brands, seeking to host their events in a premium location within close proximity to the area. Being the only luxury hotel located in DIFC, and accessible by a direct walkway, the diverse event spaces at The Ritz-Carlton, Dubai International Financial Centre offer a prime location for corporates and brands seeking outside catering support for events in the gallery spaces. In February, the five star hotel provided catering for over 100 people for the launch of the new Spring collection from Gap in Cuadro Gallery, and March will see the hotel catering for two further high profile events in the gallery. "The hotel is seeing a strong increase in the number of fashion and lifestyle brands wishing to hold events in the hotel, and we attribute this to our proximity to the thriving arts scene in DIFC, our own credentials as a lifestyle destination, and our ability to offer creativity and flexibility in creating bespoke events." Banana Republic will launch its new Summer collection in early March on the hotel's No.5 Terrace, and Matchesfashion.com will host a four-day series of launch events towards the end of the month, with high profile Guest Designer Peter Pilotto. 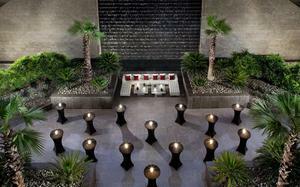 The luxury hotel in Dubai also has an ongoing partnership with Opera Gallery, who loans the hotel artwork on a quarterly basis, and held their first auction in the Middle East at The Ritz-Carlton, Dubai International Financial Centre in October 2012. In addition, the luxury hotel has recently recruited a new Executive Banquet Chef, Manuel Caicedo, who was previously at the prestigious Hotel Arts Barcelona for six years, famed for its affinity with high profile art and culture events. Since joining The Ritz-Carlton, Dubai International Financial Centre Chef Manuel has created a number of highly creative, bespoke menus for the hotel's lifestyle events, including innovative Lipstick Gazpacho canapés and Goat's Cheese Lollypops. For event enquiries, please call The Ritz-Carlton, Dubai International Financial Centre on +971 4 372 2222. The Ritz-Carlton Hotel Company, L.L.C., of Chevy Chase, Md., currently operates 82 hotels in the Americas, Europe, Asia, the Middle East, Africa, and the Caribbean. More than 30 hotel and residential projects are under development around the globe. The Ritz-Carlton is the only service company to have twice earned the prestigious Malcolm Baldrige National Quality Award, an award that originated in 1987. Its purpose is to promote the awareness of quality excellence, recognize quality achievements of companies and publicize successful quality strategies. The Ritz-Carlton Hotel Company won the award in 1992 and 1999. For more information, or reservations, contact a travel professional, call toll free in the U.S. 1-800-241-3333, or visit the company web site at www.ritzcarlton.com. The Ritz-Carlton Hotel Company, L.L.C. is a wholly-owned subsidiary of Marriott International, Inc. (NYSE: MAR). Being the only luxury hotel located in DIFC, and accessible by a direct walkway, the diverse event spaces at The Ritz-Carlton, Dubai International Financial Centre offer a prime location for corporates and brands seeking outside catering support for events in the gallery spaces.